We work with small 1-2 person companies, as well as with large corporations. We know you might want to test out our team first, before you commit to a larger project. And we’re okay with that. We have no minimums for working with us. 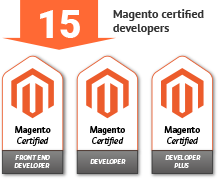 We work with Magento for more than 6 years, and have solved thousands of tough tasks, gathered tens of man-years experience, delivered hundreds of Magento solutions – let us help you and be your development partner. Outsourcing Magento development to us is easy – we have experienced team of 40+ people and know all ins and outs of Magento. Please feel free to contact us to discuss possible cooperation.